There is no such thing as a good accident, though usually ones with animals leave the driver alive and in most cases unharmed. It is when people swerve to avoid an animal, or brake too fast leaving the driver behind no time to react, when the driver may be hurt. 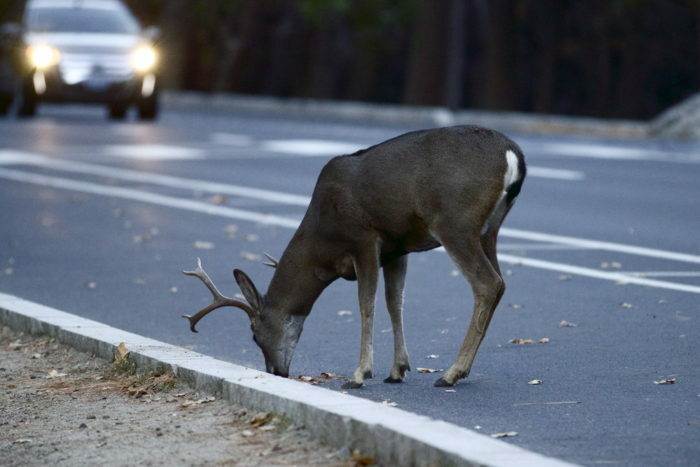 Learning ways to avoid animal collisions is helpful, as there are ways you may be able to save both the animal and your car next time you encounter a critter crossing the road. Know Your Surroundings – Knowing your surroundings is something that is important for multiple reasons. It lets you know of other dangers that might be around—say another car driving recklessly. What it also lets you know, though, is whether you will or won’t have anywhere to drive, assuming there is an animal that runs out in front of your car. High-beams – As long as there is no one coming in the other direction, high-beams at night can provide a lot of light that would not be present without them. This extra light helps to spot animals quicker, giving the driver more time to respond and brake, or perhaps honk the horn to alert the animal. Slow Down – If you are driving through an area that is known to have a lot of wildlife activity, chances are you should be driving slower than you would on other roads. Driving a little slower will give you extra time to both see the animal, and avoid it if it runs out in the road. Brake – Sometimes, there is no time to react and slow down, but it is a lot smarter to simply brake and hit the animal, than to swerve off the road or into oncoming traffic. This will cause a much greater accident in the long run, potentially endangering another party. If you or a loved one has gotten in a serious car wreck due to the negligence of another driver, finding a law attorney may benefit you. At Stoloff Injury Law, we have a team of attorneys waiting to assist you. Contact us today to schedule a consultation.